So, what exactly is a monoprint? 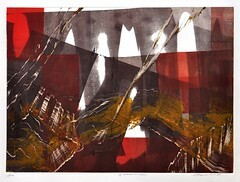 Variations of this method of printmaking can be used in a number of different processes. The broad definition of a monoprint is a print that can’t be reproduced. To make a monoprint, a printmaker applies various medium such as oil paint, etching ink, or watercolour to a flat surface. This media can be manipulated in many ways to produce the final image. The chosen surface can be hand rubbed, or put through a press to transfer the image to paper, canvas or even cloth. Monoprinting is often referred to as a painterly method of printmaking, and is an excellent introduction to printmaking for both adult and youths. Monprinting may also be used in conjunction with an etched plate. The printmaker may first ink and wipe their plate in the traditional way. Then before running that plate though the press they can add monoprint elements to the flat raised surface areas of the plate. This results in an etching with monoprint elements. This image can not be reproduced exactly the same in successive runs of the etched plate. Nature or botanical prints – The process of inking a plant or a leaf and transferring the resulting image to paper or other surface, via a press or by hand rubbing. This process along with pressing and drying plants was used to create a record of botanical species, for future identification. Also, included under Nature prints is a print or rubbing made from feathers, or other animal parts. Gyotaku – From the Japanese, gyo “fish” + taku “rubbing” While this method of printmaking is actually derived from nature it is considered a genre all its own. This traditional form of printmaking was established by Japanese fishermen to record their catch. They would apply sumi ink to the fish, and then rice paper would be placed over the fish. They would then hand rub the paper to transfer the image. This method of printmaking has become quite popular. Rubber fish poured from molds are available and are used in classrooms to teach Gyotaku to young children. This genre has also evolved into a fine art all its own. If you do an online image search with the word Gyotaku you will find incredible colourful images created from many different marine species.